What is a Mercedes-Benz Certified Pre-Owned Vehicle? Owning a Mercedes-Benz has never been easier at Mercedes-Benz of Denver. Vehicles specifically chosen for this group must meet stringent criteria and pass a rigorous inspection process to ensure the highest quality. 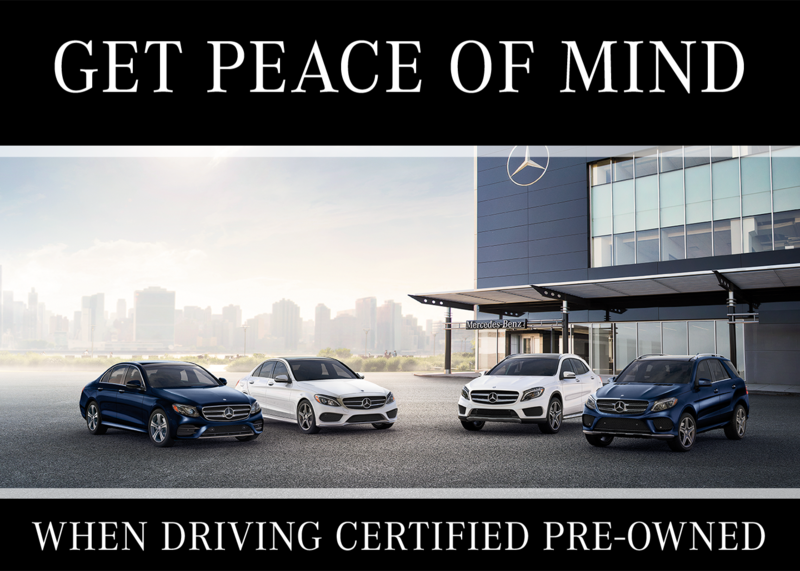 Beyond the assurance of this exhaustive process, we're sure you'll find the perfect Certified Pre-Owned Mercedes-Benz that's meant for you. What Is Certified Pre-Owned Mercedes-Benz? For starters, any remaining portion of the Mercedes-Benz 4-year/50,000-mile* New Vehicle Limited Warranty applies to the vehicle. After that, Mercedes-Benz CPO Limited Warranty provides comprehensive vehicle coverage for another 12 months, or up to unlimited miles. * For those MBCPO vehicles that are no longer covered by the new vehicle warranty, the MBCPO Limited Warranty takes effect at the time of delivery. To qualify, a Mercedes-Benz vehicle must meet stringent criteria and pass a rigorous 165-point inspection. You're just a phone call away from roadside assistance, trip navigation assistance, technical help or Sign & Drive Service. Over 300 dealers nationwide honor the CPO Limited Warranty and Extended Limited Warranty. Every CPO vehicle comes with a 7-day/500-mile exchange privilege. Mercedes-Benz of Denver has an impressive range of Certified Pre-Owned vehicles for you to choose from. Now you can take advantage of special financing rates on select Certified Pre-Owned Mercedes-Benz vehicles. When you choose a Certified Pre-Owned Mercedes-Benz from Mercedes-Benz of Denver, you get more than an extraordinary vehicle. You get peace of mind knowing that your vehicle is backed by one of the most comprehensive pre-owned warranties available. We invite you to schedule a test drive today and experience the difference for yourself. Customers may also add an additional 12-24 month warranty to the vehicle. **Please see your Mercedes-Benz Dealer for a copy of the Mercedes-Bens Certified Pre-Owned Limited Warranty.